UConn is reducing the fossil fuel dependency of its fleet, one vehicle at a time. Nearly a quarter of the University’s light duty fleet is comprised of electric (EV) or hybrid-electric vehicles. That figure continues to grow as the University expands the number of EV charging stations around campus. On-campus charging stations are available to the public and are free to use. EVs and hybrids have significantly lower emissions and are quieter and more cost effective to operate. To request the installation of a charging station, please submit a work order specifying your request. Departmental funds must be available to cover the cost of purchase and installation. Find the EV Charging Station Closest to You! 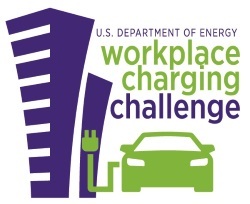 In February 2015, UConn’s Office of Environmental Policy signed a pledge for the university to participate in the U.S. Department of Energy’s Workplace Charging Challenge. UConn was eligible to participate in the challenge because of the electric vehicle charging stations on campus used primarily for employee use. This pledge commits the Office of Environmental Policy to assess and promote the use of electric vehicle charging stations on campus. Benefits of joining the challenge include informational and technical resources, peer to peer exchange and information sharing, recognition of charging station successes, and support from Challenge ambassador organizations like Green Parking Council. The Challenge also provides UConn with support in assessing whether or not workplace charging is right for the university. UConn is responsible for assessing employee demand for charging and setting a minimum goal for providing for employees driving electric vehicles. The university is also required to develop and implement a partner plan to capture a workplace charging strategy.